I used to believe that Biryani’s have to be made in a cooker, or slow cooked for hours in a handi for the best taste effect , but I was recently thumped by a food show on NDTV titled ‘Cooking isn’t rocket science’ in which the host had an entirely different take on biryani, albeit an interesting one. She called it British Biryani, however, as I have taken a few liberties with the recipe , I think it just might as well have a new name to suit the Bengali twist and call it Baked Bengali Biryani. 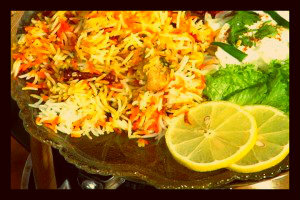 Athough this recipe sounds English, this biryani involves all the nuances and experiences of a traditional one. Chopping all the vegetable, grinding of aromatic spices, soaking saffron in warm milk and releasing the fragrant aroma while the vegetables...really its just as good as the old fashioned one. If you come to think of it, Biryani is derived from the Persian word 'Birian' and In Farsi, Birian means 'Fried before Cooking'. Which I did , so it's not that much of a deviation—and serves the dual purpose of keeping the purist in me happy. I usually make this biryani with chicken and eggs. This also can be made only with ONLY vegetables. Clean and soak the rice for at least half an hour. Add a spoonful of oil and required salt for the rice. Cook in 2 cups of water till the water is absorbed. Set aside. Temper the oil with all listed under nos 9. In that frying pan over a low heat, fry the marinated chicken . Chopped onions go in first , followed all under nos 8, green chillies, ginger and garlic paste till well browned , now add to it the tomatoes and fry a little . Add salt and fry for 5 minutes, and now add the potatoes. In an oven proof dish, layer the rice. Add half of the fried onions. Add all the marinated chicken and potato mixture on top of the onions. Add all the chopped coriander. pour half the saffron milk .Cover this by another layer of rice. Sprinkle the remaining onions. pour remaining saffron milk. Add a tbsp of butter. Cover with foil and bake for 30 minutes or till the chicken is done.The divine smell of all the spices and the unmistakable aroma of biryani will soon fill the house. Top it with halved boiled eggs and serve immediately.